I was just talking to Rex the other day about how summer is already half over, is it bad of me to say that I'm totally ok with that. 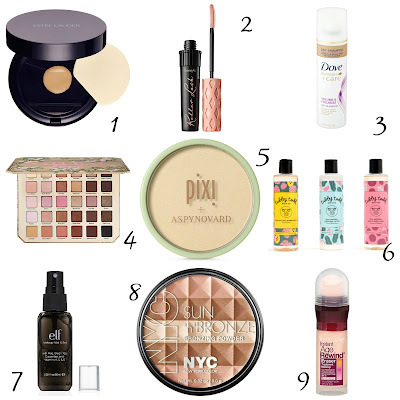 Haha I've always been a fall/winter kind of gal but I am loving the summer beauty products I've been using this summer. I've been using so many new products this year (trying to switch my routine). 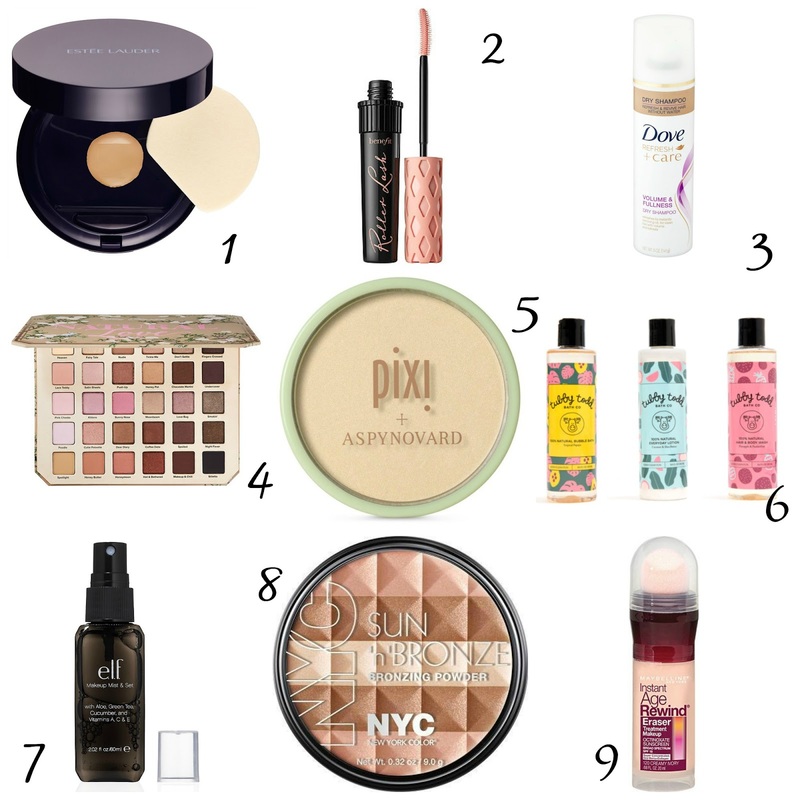 Most of these products I found out from bloggers, my ipsy bags, and of course you guys, so thank you so much for all your recommendations! So let's hope right in! 1. Estee Lauder Double Wear Liquid Compact , this came in my Ipsy bag as a full sized item and I was soo happy not only because I've never tried an Estee Lauder product but because I've heard so much great things about this product! So creamy and has great coverage, I have found my newest foundation obsession! 2. Benefit Roller Lash I believe I got this for my birthday this year and it came as a mini size but I love trying different mascaras and this one packs so much volume for your lashes, I love it! 3. Dove Refresh Dry Shampoo , so ever since I heard of dry shampoo I've always wanted to try it and I tried Batiste and didn't really love it, I think it was because it sprayed and came out too gray, I dont know maybe I didn't spray right ahha but this one when it spray it doesn't come off gray on my hair and it keeps my hair refreshed and smelling good, leaving it like I washed it. But seriously where would we be without dry shampoo, the thing is gold in a bottle! 4. Too Faced Natural Love Eye Shadow Palette, guys this stuff is amazing not only are the colors colors that you can use for an everyday look but this palette is super pigmented (like all their stuff) but this is a definite must in your beauty collection! 5. Pixi with Aspyn Ovard Highlighter, I have also recently started using highlighter and it truly is a came changer! This came in a swag I received from a fellow blogger friend and I already follow Aspyn on her Youtube channel, and when I heard she was collaborating with Pixi I was beyond excited. So of course you can imagine my excitement when this came in my swag bag! The color of this is perfect, its pigmented, and looks amazing on your skin, seriously a 10 out of 10 for me, I love it! 6. Tubby Todd Tropics Summer Bundle, I know I know you've heard me rave about this company but guess I can't get enough of their scents and their products! I think the reason why I love it because it works for all skin types, helps with several different things, and everyone in the family can use it! They just released their summer tropics collection and these scents are to die for! Maybe not literally but they smell like you're in Hawaii and for me that's the kid of lotion I want! 7. Elf Mist & Set Spray, another new item I have added into my makeup routine is a set spray. Because this is a entirely new item for me, I didn't want to spend a much of money on one, so I put my trust to elf cosmetics where they sell it for $3 and it I'm loving mine! It leaves my makeup all day and also gives me a refreshing mist for these hot summer days. 8. NYC Sun n' Bronze Bronzer, this is also my very first bronzer I ever got, and it truly lives up the their product name, your skin truly has a beautiful sunny touch and gives you a light tan look to your face, I love it! 9. Last but not least Maybelline Instant Age Rewind, Dark Circle Concealor, I discovered this from a blogger friend and I've used elf or a different brand for concealer but none have worked and covered up dark circles or imperfections like this one has, I mean its affordable and does exactly what it says it does, I don't think I'll ever switch to a different concealer, this stuff is amazing! I love all these product recommendations. I am adding a few to my list. I agree with you. This Summer has been too hot for me for some reason. I'm ready for Fall. These products look great. I love it when people share what they love, it gives me confidence when looking for something new. Do you have any recommendations for a good eyeliner that doesn't smudge, or just melt off your face in this heat?